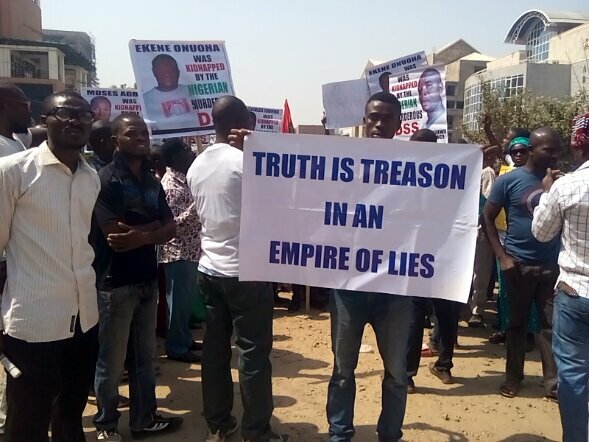 Millions of Biafrans have called for the immediate resignation or sacking of the new judge presiding over the trial of the leader of Indigenous People Of Biafra, Nnamdi Kanu, whom the Nigerian government has accused of alleged treasonable felon. Ms Binta Nyako who is the third judge to preside over the high profile case is due to oversee the full commencement of the trial today, January 10, 2017. Meanwhile, the judge who hails from same state of origin with Nigeria president, Muhammadu Buhari, is not having a smooth ride over the case she inherited from the resigned Justice John Tsoho in September 2016, as she is being accused of complicities in handling the case of the IPOB leader and his co-defendants. Judge Binta Nyako had on December 1, 2016 denied Nnamdi Kanu and his co-defendant bail, which was followed up by her controversial ruling two weeks later on December 13, in which she granted the request by the Buhari led Nigerian government seeking for a secret trial of Nnamdi Kanu and co-defendants. As a result, Biafrans and a cross section of human rights activists and organisations in Nigeria has since lambasted the rulings of Binta Nyako, pointing out that it is against the tennets of democracy and the human rights of Nnamdi Kanu who has been incarcerated for over a year alongside two other defendants, Benjamin Madubugwu and David Nwawusi. The judge is also being accused of using Nnamdi Kanu's to secure a smooth relationship with the federal government as her husband, Murtala Nyako and children are currently being investigated on charges of different fraud and corruption cases. "Binta Nyako is a corrupt judge, she must go. She can never use the case of our leader to save her rotten family. No way!" a Biafra activist, Abuchi Okeke told Family Writers. "She has overstepped her boundary by moving to try our leader secretly, their plans are dead on arrival, because we can never allow it to happen. She should from the case or get ready to be disgraced out of legal profession."